Bitcoin is an open digital network that allows anyone to use it, if you have Bitcoin you can send some to anyone else in the world for almost no cost at all. To accept Bitcoin payments we do not have to sign up to a bank or payment processor or pay any of their fees. We have partnered with a local company, Maine Bitcoin LLC. They buy our Bitcoin so we can continue to fill orders, but we keep approximately 50% of our total holdings in bitcoin because we believe in its future! 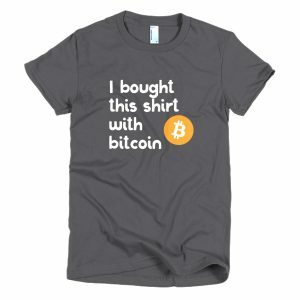 We have plenty of Bitcoin designs in our shop as well, check some out if you are as enthusiastic about Bitcoin as us! You might be wondering , what is bitcoin? Bitcoin is a decentralized currency that exists on the internet. It allows near instantaneous payment to anyone, anywhere in the world without a financial institution or a government to restrict usage. You can learn a lot more at bitcoin.org.